The Dead Do Tell Tales... A pioneer in forensic anthropology, Dr. Bill Bass created the world's first laboratory dedicated to the study of human decomposition. Bill Bass's research at "the Body Farm" has revolutionized forensic science, helping police crack cold cases and pinpoint time since death. In this riveting book, the bone sleuth explores the rise of modern forensic science, using cases from his career to take readers into the real world of "CSI." Some of Bill Bass's cases rely on the simplest of tools and techniques, while other cases hinge on sophisticated techniques Dr. Bass could not have imagined when he began his career: using computer data and video image processing to help identify murder victims; harnessing scanning electron microscopy to detect trace elements in knife wounds; and extracting DNA from a long-buried corpse, only to find that the female murder victim may have been mistakenly identified a quarter-century before. Witty and engaging, Bass dissects the methods used by homicide investigators every day, leading readers on an extraordinary journey into the high-tech science that it takes to crack a case. In his well-received memoir "Deaths Acre," forensic anthropologist Dr. Bill Bass and writer Jon Jefferson recount some of the riveting cases that have made Dr. Bass a legend. Now they explore further murders, mysteries, and the revolution in forensic science. Abridged. 5 CDs. 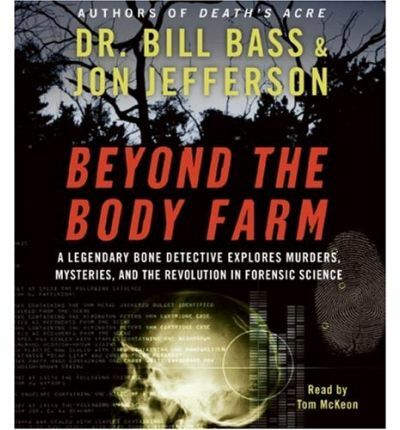 About the Author: Dr. Bill Bass is a world-renowned forensic anthropologist who founded the University of Tennessee's Body Farm—the world's first and only major scientific facility devoted to studying human decomposition. He is the author of more than two hundred scientific publications, as well as an acclaimed nonfiction account of the Body Farm, Death's Acre. Dr. Bass is also a dedicated teacher who has been named National Professor of the Year by the Council for Advancement and Support of Education.